Dairy whey. After suitable clarification, pasteurization and skimming, whey can be separated in two fractions: a Retentate, containing practically all solids (Whey proteins, Lactose and Salts) and a Permeate, containing practically water and a big part of Sodium Chloride (if present in high quantity in whey/whey cheese, the Nanofiltration process is downright similar to Reverse Osmosis, with the difference that in Reverse Osmosis all the solutes are concentrated, while in Nanofiltration the Sodium are lower). In case the concentration has as a final target the preparation of a powder or a Liquid Concentrate intended for Human or Animal nutrition, the NF is absolutely recommended, as it lower of at least 40% the Sodium concentration in the final powder (it can be reached the 8% of Sodium on dry). Milk (whole or skimmed). In this case, the same applies as for the treatment of milk with Reverse Osmosis. 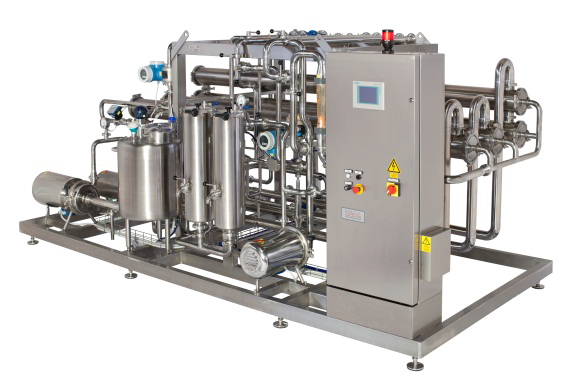 The Nanofiltration processing, unlike the concentration by Ultrafiltration, enables to prepare a pre-concentrated milk containing all Lactose and therefore to move to a subsequent cheese making, obtaining compounds like puddings or sweet cream cheese, very suited for baby foods.